Cake Pops have made their way into the world and are taking it my storm! The first time I heard someone mention a cake pop I had no idea what they were talking about. Was it cake made with pop? Then I had one and I was hooked! Not only were they cute but they were delicious! Cake Pops have quickly become a favorite treat in this household and one that the kids love helping make and eat! Of course! I think my daughter's favorite part (other than eating them) is getting to add the sprinkles. Extra sprinkles make them taste extra good! What is a Cake Pop? Basically it's a small ball of cake on a stick, much like a lollipop, dipped in candy melts and cleverly called a Cake Pop! 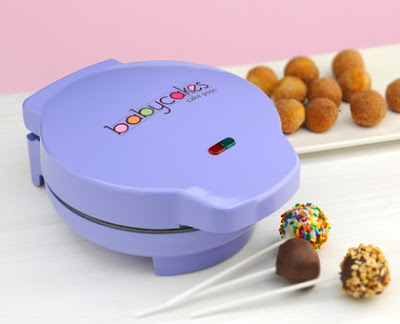 I was recently given the opportunity to receive the Babycakes Cake Pop Maker and jumped at the chance! When our Babycakes Cake Pop Maker arrived the kids and I couldn't wait (and we didn't) to try it out. We quickly got out all the cake mix ingredients and sprinkles and started our very first experience with making Cake Pops of our own. We all LOVE cherries and decided to make the Maraschino Cherry Cake Pops! Prepare cake mix according to package directions (which includes the egg white),substituting maraschino cherry juice for water. Fold in chopped maraschino cherries. Fill each cooking reservoir with about 1 tablespoon of batter. Bake 4 to 5 minutes or until a toothpick inserted into a cake pop comes out clean. Allow to cool and glaze or coat, as desired. Use a chocolate candy melt coating for a taste similar to a chocolate covered cherry. It took us a couple of tries to get all of our cake pope perfectly filled. The first couple rounds we had some that we too shallow and then a couple that were too full (as you can see in the photo). The recipe called for only 1 egg white... my 7 year old daughter had cracked and added two whole eggs while I was on the phone. However, they turned out moist and delicious - ALL OF THEM! Of course we had to decorate all of our cake pops with sprinkles. We used rainbow sprinkles, chocolate sprinkles and even some crushed walnuts. The cake pops with chocolate sprinkles tasted exactly like a chocolate covered cherry. Absolutely delicious! Clean up was quick and easy. In fact I simply wiped it down with a damp cloth and was done in a matter of seconds. Not a single thing stuck to the surface. If you didn't know any better you would never know that my Babycakes Cake Pop Maker had ever been used. Thank you, Babycakes for making a product that is so easy and convenient to use! My family and I couldn't be more thrilled or satisfied! I know that we will be using our Cake Pop Maker more times than I can count and I'm looking forward to it! In fact, I've already had several requests from friends and family to make some for them so I guess I need to get started. You can purchase Babycakes products online through their website as well as in retail stores and on Amazon. **I wrote this review while participating in a campaign by Mom Central Consulting on behalf of Babycakes and received a product sample and a promotional item to thank me for taking the time to participate. Cake pops are so cute and so much fun! They make the perfect treat for any party or special occasion!